Now available on DVD. For players of all standards the key to a lower score lies in "The Short Game", and in this 90-minute DVD David Leadbetter will take you step-by-step through each of the basics. By way of detailed explanation, drills and tips, you will learn the variety of shots that can be played on and around the greens. You will know which shots to play in different situations and develop the touch necessary for a great short game. 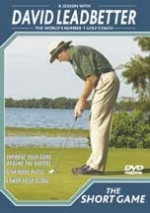 Leadbetter has divided this DVD into four sections: putting, chipping, pitching, and sand play. Within these four segments, Leadbetter gives drills to improve each area. He talks about understanding the techniques used and why they are important. He shows his students before and after the lesson, then compares the results. The lessons are easy to follow and each section includes "Advanced Score Savers" for the more adventurous golfer. So learn how to practice your short game the right way, and lower your score today with this DVD!